Invest in a critically needed new tractor for Kajjansi airfield. 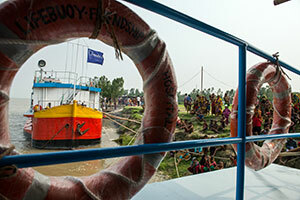 MAF in Bangladesh makes use of the numerous waterways with the only amphibious aircraft in the country. Most of our flights are for aid, cyclone relief and preparedness, development organisations, government agencies and medical groups, getting the right people to the right place at the right time. Bangladesh is one of the world’s poorest, most densely populated and least developed countries. One third of the population of Bangladesh lives below the poverty line. Many people are landless and forced to live on and cultivate flood-prone areas. Severe flooding from the annual monsoon, droughts and cyclones pose serious threats to lives and livelihoods. Although surrounded by water, many of the waterways, especially fishing areas, are polluted by the use of commercial pesticides. A staggering one quarter of all deaths in Bangladesh are from preventable, water-related diseases. With more than 8,000 kilometres of rivers and the huge Ganges Delta, travelling to receive help is virtually impossible. MAF’s amphibious aircraft makes use of the numerous waterways to reach the most isolated and remote regions. Most of our flights are for relief and development NGOs, government agencies and health workers, enabling them to reach remote communities efficiently. MAF partners with organisations like WaterAid as they build filtration systems and train locals to use them. We also partner with Impact and Friendship’s three floating hospitals as they provide the only medical care for the isolated communities living along the riverbanks, and many other non-government organisations. Our operation, which has been running since 1997, has also played a fundamental role in disaster relief. When Cyclone Sidr hit in May 2007, MAF flew three flights a day, seven days a week for three months to help with the relief effort. Our services were called on again in 2013 with Cyclone Viyaru (Mahasen). MAF partners with over 80 organisations in Bangladesh, making a difference in countless lives. For over 70 years, MAF has been serving isolated people by using aircraft to bring in the essentials of life as well as medical care, emergency food, and Christian hope. Our purpose is to deliver practical and spiritual care to people in places of deepest human need. Every three minutes, an MAF plane takes off or lands somewhere in the world. These flights enable crucial work by many aid and development agencies, missions, local churches and other national groups. MAF is serving the Church and communities in remote areas where flying is not a luxury, but a lifeline.